After anticipating a Schipperke puppy for years, I got the call one morning that one of our clients would be having Schipperke puppies. I had delivered puppies for one of her other Skipps years ago and wanted one ever since – a little black bundle of energy that looks almost like a fox. We brought home Lief at 6 weeks old to our two Labrador retrievers – Hannah and Jake. Jake has both canine and food aggression but we watch his triggers and keep food away unless it is a controlled environment. He has had private obedience training and we do lots of trails walks and runs. While we were away some ice cream fell on the floor and both Lief and Jake went for it. Jake’s instincts and food aggression took over, and he bit Lief, unfortunately Lief was so small that the bite was severe. He was rushed to Huronia Emergency Veterinary Clinic by the babysitter, where we rushed to meet him. The poor little guy was pretty quiet but stable. He was on oxygen and had a very sore and bloody muzzle. It was difficult to examine him at the time. We stabilized his muzzle with a light wrap and gave him pain control. Fractures could be felt in his mandible (lower jaw) and maxilla (upper jaw). We took him to Veterinary Emergency Clinic (V.E.C.) on Yonge St in Toronto to see Dr. Sharon French – a specialist veterinary dentist. She diagnosed the mandibular fractures and fractures of the zygomatic arch (cheekbones). 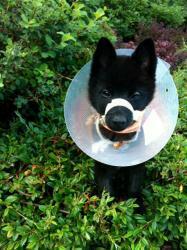 Luckily, in such a young puppy this heals quickly and can be treated with a tape muzzle, which she applied. A feeding tube was also placed in the side of his neck into his esophagus. This is where it helped a lot having a vet as his owner – we tube fed him every hour and changed his tape muzzle weekly. He was a trooper and in 3 weeks his jaw was healed. The care at V.E.C. was phenomenal and I’d really like to thank Dr. Sharon French, Dr. Dawn Crandell and Dr. Sue Cochrane. I really know what it is like on both sides of a case; as both a concerned pet owner and as a veterinarian.